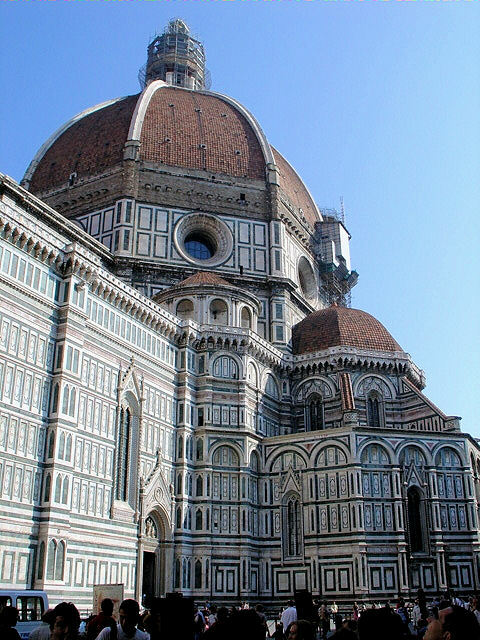 Santa Maria del Fiore, aka Duomo, &ndash; the flower of Florence, Italy! Santa Maria del Fiore, aka Duomo, – the flower of Florence, Italy! Santa Maria del Fiore, aka Duomo, in Florence Italy. Santa Maria del Fiore – the Duomo – the centerpiece of Florence city centre evokes wonder and awe, not to mention an overwhelming sense of feeling quite dwarfed as you stand beside this titanic cathedral. Looking up, the unmistakable Brunelleschi's dome and Giotto's campanile rising majestically alongside. Steeped in history, the Duomo and the site on which it stands has been the religious center of Florence for more than 1,600 years when Florentia, as it was known in the 4th century, was bustling not with Florentines, but Romans. Santa Maria del Fiore translated means Saint Mary of the Flower, the Flower being Christ Himself as the fruit of our salvation. Designed by Arnolfo Di Cambio, construction began on the cathedral in 1296 and completed, sans the dome, in 1348. It wasn't until nearly 100 years later in 1436, that Brunelleschi's "dome within a dome" was completed and finally capped off with his lantern 10 years after that. Containing holy relics, the gilt copper ball that adorns the top of the lantern was added in 1471 marking the end of a construction period that spanned 170 years. Make the effort to climb up the 463 steps to the top of the dome for a jaw-dropping views of Florence! Brunelleschi's Dome forever changed the Florentine skyline when completed in 1436. Truly a sight to behold in person, this cavernous edifice stretches 153 meters (502 feet) long, 90 meters (295 feet) at its widest point and 90 meters from floor to the top of the dome. Covered in green and pink marble framed with white marble strips, the facade of this great cathedral wasn't completed in the 15th century, but nearly 400 years later by Emilio De Fabris. Adorning the niches over doors and along the sides are myriad statuary including Mother Mary enthroned with a flowered scepter, and mosaics depicting scenes of Christ, Saint Mary and Saint John the Baptist as well as scenes of the lives of Florentine artisans, merchants and other prominent figures of the time. Close up of architectural details over Southern doorway. 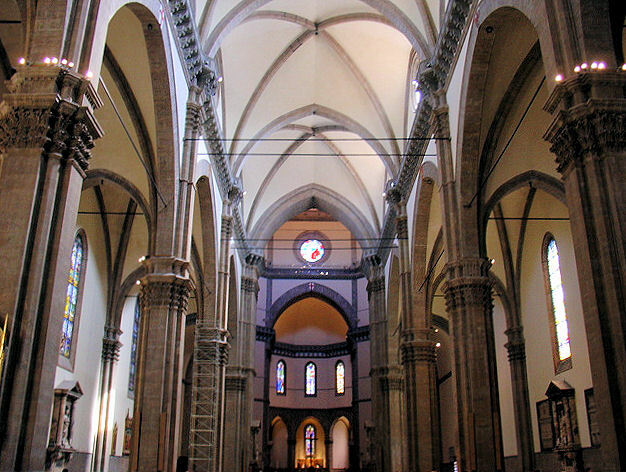 Compared to the highly adorned exterior of the cathedral, the interior is more reserved in its design and features frescos painted by the Florentine masters in the 14th and 15th centuries. Along the walls, you'll discover frescos by Paolo Uccello, Adrean del Castagno, a painting of Dante and his "Divine Comedy" by Domenico di Michelino and sculptural portraits of Giotto and Brunelleschi. Later in the 19th century, busts were added of Arnolfo di Cambio, the original cathedral designer, and Emilio De Fabris, the 19th century exterior designer. Adorning the interior walls of the dome, 295 feet into the air is Vasari's "Last Judgment" which was ordered and commissioned by Cosimo de Medici. Brace yourself, the painting is 295 feet away and neck strain is inevitable but worth it nonetheless. The artist, Vasari, is the same man who designed the "Vasari Corridor" that stretches from the Uffizi Gallery across the Arno River to the Pitti Palace. Be sure to rent an audio guide on your self-guided tour of the inside of the Santa Maria del Fiore to discover all the treasures that await. Vasari's 'Last Judgment' adorns the dome's interior 90 meters up! After your tour of the interior, be sure to look just inside the front doors of the cathedral and to the left to find a stairway descending into the past. This is your portal back in time to the ancient Christian basilica – Santa Reparata that stood on the site in the 4th century and was only recently discovered during a major restoration project in 1966. More on that in an upcoming article. That rounds out the tour of the Santa Maria del Fiore. Often overlooked as a point of interest in Florence, a visit to this majestic cathedral is time well spent! Santa Maria del Fiore does not charge admission to the cathedral and the lines can be quite long in the morning. Tour the city of Florence, perhaps have lunch and then visit the cathedral in the afternoon when the lines are shorter and move along at a quicker pace. Also be sure to rent an audio guide, 3 Euro, if you’re on a self-guided tour so you don’t miss any of the details! Giotto’s Campanile, the bell tower alongside the Duomo, does charge a nominal fee, 6 Euros last time I was there, to walk up 414 steps to the top of the bell tower which contains seven bells. The visit is well worth the expense and quite invigorating, if not down right exhaustive, for a spectacular bird’s eye view of the Duomo and surrounding Florence. Check out this amazing 360-degree tour! Santa Reparata charges a nominal fee or 3 Euros last time I checked, to enter this 4th-century basilica that lies beneath the Duomo. It's a fascinating look 1,600 years into the past and once again, well worth the expense to discover ancient frescos, mosaics, tombs and the altar. So beautiful, one of my fav place in Florence. climb up the duomo was quit tiring but when you get up there the view was so stunning that I know it's so wroth it. Thanks so much for for stopping by and sharing your experiences. It is one of my fav spots as well...esp at the top....Giotto Campanile also amazing...watch out for those peeling bells!! What an amazing building! Will definitely have to make my way back to Florence & take it in. We only passed thru the train station in Firenza and didn't have time to stay and look around. Europe is so filled with wonders. Thanks for sharing them with us, Jeff. Doreen my friend, you have missed one of the most amazing cities in the world and one of my faves. When you make it back, make sure you give yourself at least 3 days in Florence and the surrounding Tuscany region. I promise, you won't regret it. Stay tuned for lots more about Florence my friend. Thx for stopping by and sharing your thoughts.